As the title of the post have it, I got to borrow a wide angle lens for my Nikon D60 from a buddy of mine! It is a Sigma 10-20mm, and I tried it this morning with some sample shots at NTU since I missed my original plan of going to Marina Barrage in sunrise. Yes! I overslept, but that is to be expected when I spent the night out with friends the day before. Anyway, off I went towards NTU and while the weather looked like on the verge of raining on my way there, I was greeted by clear blue skies with fluffy clouds which made for a great background! South Spine of NTU. Taken with Sigma 10-20mm, 1/400, f/10.0, ISO 200. From there, I moved on to the oldest building on the campus which presently houses the Chinese Heritage Center. 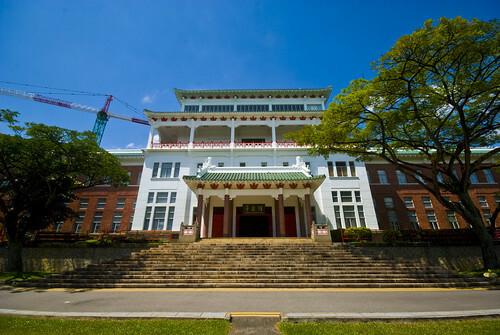 Chinese Heritage Center at NTU. Taken with Sigma 10-20mm, 1/250, f/10.0, ISO 200. 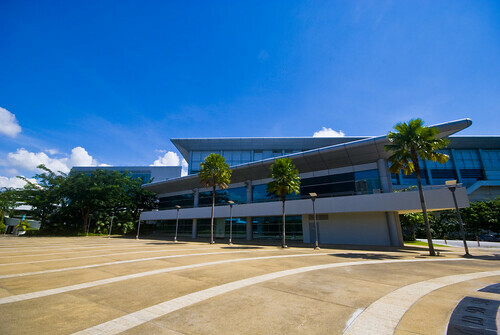 Another unforgettable spot would be the Heart of NTU with some of its architectural landmarks such as the Nanyang Auditorium and the Research Techno Plaza. Nanyang Auditorium. 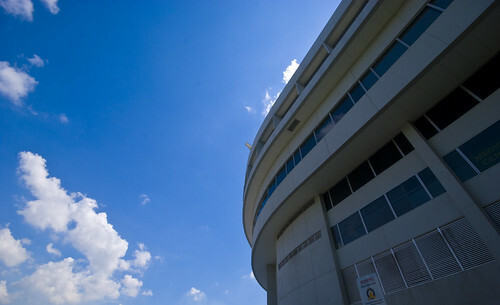 Taken with Sigma 10-20mm, 1/400, f/10.0, ISO 200. It was my first time using a wide angle lens and it does bring out some excellent images for landscape photography and it is also useful to bring out some of the details of modern architecture as the edges of the rooftops in the Nanyang Auditorium is really brought out more prominently. In fact, the 1st and last photos are some of my favorite shots and it was really fitting that I could take these shots in my alma mater.